We’ve had the pleasure of working with Northampton Borough Council on two great public safety campaigns over the last couple of years. Northampton Borough Council has been great to work with, but the issue of public safety can be a tough nut to crack. With topics like night-time safety and knife crime, it would have been easy to go with fear-led campaigns, but these can be very hit and miss. These campaigns needed a lot more thought and a delicate touch. Who is Northampton Borough Council? Northampton Borough Council is responsible for the short and long-term management of government activity in Northampton. They also work in partnership with community safety organisations, which is where these campaigns came in. The first step in each campaign was to meet with Northampton Borough Council to better understand their campaign aims. They told us about the performance of previous campaigns and what they liked and didn’t like. They also gave us information about their intended audiences. We took all that information and added to it our own experience and research to come up with some bespoke concepts. We then worked closely with Northampton Borough Council to build upon, transform, and refine those concepts. The night-time safety campaign, published in 2017, was aimed at 18-30 year-olds. Whether it’s walking home in winter or getting around on a night out, everyone likes to feel safe when they’re outside after dark. Fear-led campaigns and those leaning toward victim-blaming wouldn’t work well with the target audience. In fact, campaigns using those tactics can actually turn eyes away. Instead, the campaign focused on empowering people to stay safe at night. 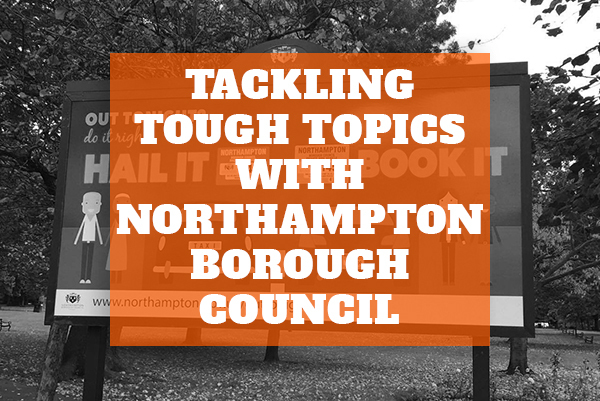 Northampton Borough Council were keen to include messaging giving advice on hailing taxis and booking private hire cars, planning nights out, and having emergency contacts in your phone. Next came campaign style. When your potential audience includes anyone found on a night out, it can make using models and actors tricky. People like to imagine themselves in the place of actors and models, meaning choice of actor might restrict our audience. Instead, the campaign made use of illustrations and animations, which are easier for people to imprint themselves onto. We developed a range of simple cartoon characters to use throughout the campaign. These characters were highly customisable and easy to portray in a range of situations, keeping costs within budget, and making for a style that was easy to re-purpose for future campaigns. 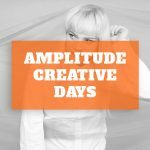 Northampton Borough Council – Do it Right from Amplitude Media on Vimeo. The final part was distribution. Since target audience was highly active on social media, we created short animations for use online. Northampton Borough Council also placed materials prominently around the town, meaning advice was visible to people while out at night. The campaign was a great success, and we were pleased when they came back to us again in 2018 for help with a campaign about knife crime. The second campaign, released in 2018, aimed to tackle the issue of knife crime, particularly amongst school-age children. 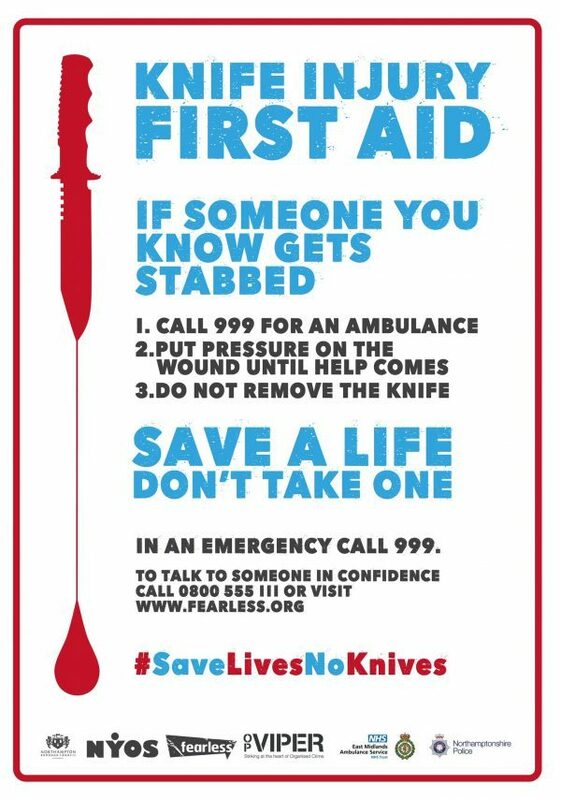 To support knife crime education programmes being delivered in schools, we worked with Northampton Borough Council to develop campaign materials to assist promoting key messages in-person and on social media. As with the night-time safety campaign, this was a tricky subject. Additionally, the audience was completely different, children instead of adults. Using information and messaging from the education programme, we helped develop materials that were slightly more fear-led than the night-time safety campaign. Northampton Borough Council advised that we needed to open children’s eyes to the damage knives can cause without resorting to graphic imagery that would make them look away. The chosen solution was a series of infographics. Using a combination of statistics and illustrations, we together demonstrated the consequences of knife crime whilst avoiding shock tactics. The silhouette of a knife is easier to look at than a picture of one, but the use of red evokes a sense of danger and ensured the infographic grabbed people’s attention. The campaign was launched in August 2018 and delivered to Northampton schools and colleges in September 2018. Last week, Northampton Borough Council announced that the campaign is being delivered to another eight schools before 2019. A total of 20 schools throughout 2018. Look for our infographics with the campaign hashtag, #SaveLivesNoKnives. Got a tough topic to cover? Click here to get in touch. Let’s see how we can help.